Share your outstanding D7200 photos with no hassle, even when on the go. Just touch your compatible smartphone or tablet± with NFC to the D7200 to establish a Wi-Fi connection. Once connected, you can use your smart device to browse photos on the D7200 and then share your favorites by text message, email or posting online. 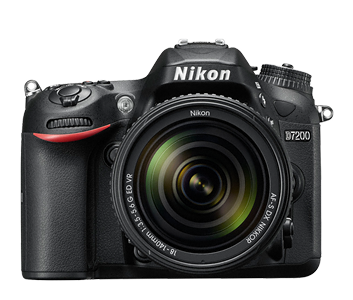 You can also use your smart device as a remote for the D7200—see what the camera sees and take pictures! Record daily life in stunning quality or experiment with new forms of creative expression. Create beautifully rendered time-lapse movies with smooth exposure variations entirely in-camera—a first for Nikon DX-format cameras. Make smooth exposure transitions with Auto ISO while monitoring with Highlight Display (Zebra Stripes). Apply Flat Picture Control for easier colour grading in post. Transfer uncompressed footage onto an external recorder with the optional HC-E1 HDMI Cable while recording simultaneously to the internal SD memory card. Use the optional ME-W1 Wireless Microphone and record clear monaural audio from subjects as far as 164ft/50m away, or attach the optional ME-1 Stereo Microphone to the ME-W1 Wireless Microphone's remote unit for stereo recording. Whether you’re capturing images in daylight or after dusk, the D7200's superb AF system will keep up. Its Advanced Multi-CAM 3500 II autofocus sensor module achieves outstanding focus detection, even at a very dim -3 EV (ISO 100, 20ºC/68ºF). Its high-density 51 focus points cover a wide area of the frame in DX format and most of the frame in 1.3x Crop Mode, while 15 cross-type sensors in the center provide higher detection strength. One centre AF point even works all the way to f/8, for greater focusing performance when using teleconverters.